German synagogal poet; died at Worms April 16, 1203. He was a member of an old family of Jewish scholars connected with that city. His great-grandfather Simson, who was living in Worms at the time of the First Crusade and was surnamed "Ha-Darshan," is quoted by Rashi on Isa. lviii. 14 and Amos vi. 3. One of Simson's sons, Samuel, is also quoted by Rashi ("Ha-Pardes," p. 33a). Jacob, another son of Simson, died at Worms during the First Crusade (1096). In his epitaph Menahem is called "teacher of the Law," "preacher," and "payyeṭan." A responsum of his addressed to the German Talmudist Eliezer ben Joel ha-Levi is preserved among the responsa of Judah ben Asher (p. 48a). Menahem is known principally through his synagogal poetry. Zunz credits him with thirty-one poems—among them being examples of "Ma'arib," "Yoẓer," "Ofan," "Ahabah," "Sulat," "Reshut," "Ḳedushshah"—as well as with a number of "seliḥot." Among his elegies the following deserve mention: "Me'one Shamayim" (which found a place in the German ritual for the 9th of Ab); "Alelai Ki Ba'u Rega'" (on the martyrs of Blois, 1171, and of Boppard, 1195; part of it has been translated into German by Zunz, "S. P." p. 250); a seliḥah on the ten martyrs; a seliḥah commemorating the victims of a persecution in 1147 or 1190. 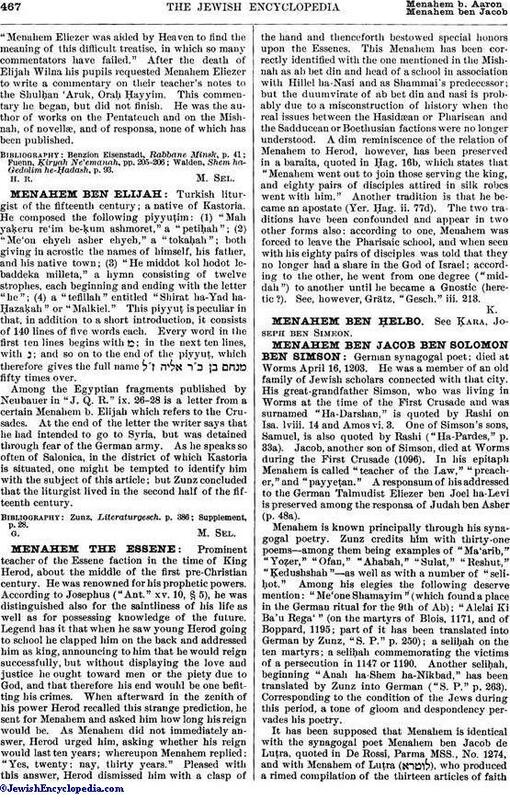 Another seliḥah, beginning "Anah ha-Shem ha-Nikbad," has been translated by Zunz into German ("S. P." p. 263). Corresponding to the condition of the Jews during this period, a tone of gloom and despondency pervades his poetry. 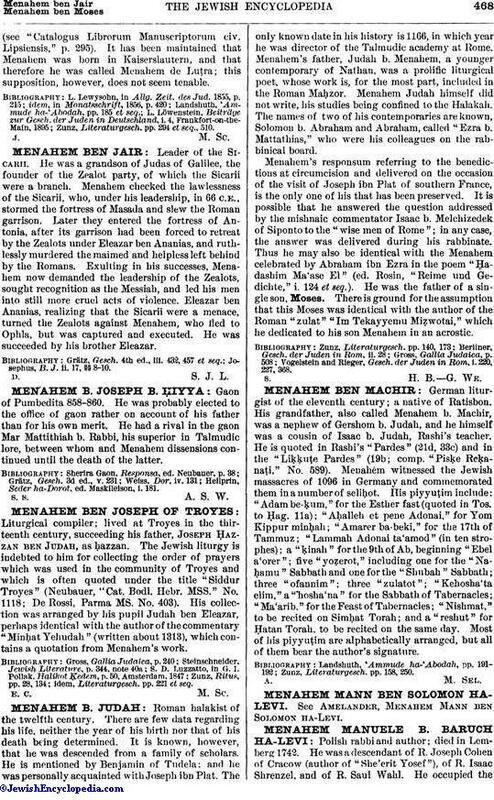 It has been supposed that Menahem is identical with the synagogal poet Menahem ben Jacob de Luṭra, quoted in De Rossi, Parma MSS., No. 1274, and with Menahem of Luṭra ( ), who produced a rimed compilation of the thirteen articles of faith(see "Catalogus Librorum Manuscriptorum civ. Lipsiensis," p. 295). It has been maintained that Menahem was born in Kaiserslautern, and that therefore he was called Menahem de Luṭra; this supposition, however, does not seem tenable. Zunz, Literaturgesch. pp. 294 et seq., 510.